Comparison of resolution. There is practically no visible difference between 3MP and 12 MP. The limiting factor is therefore the microscope or specimen, and not the camera resolution. My digital camera (a Canon EOS 450d) is capable of taking pictures at 3MP, 6 MP and 12 MP (MP=megapixels). Which setting should one choose to obtain the optimum results? If the camera resolution is too low, then this will result in the loss of image detail (but a small file). A resolution setting which is too high will result in a large file, but of low detail and empty magnification. Take a low-resolution and a high-resolution picture of the same specimen. I took two pictures each, one with a setting of about 3MP and one with the maximum resolution of 12MP. In both cases, the file compression was low (and JPG image quality high). Enlarge the low-resolution image to the size of the high-resolution image. In my case the low resolution (3MP) image had 2256 by 1504 pixels. It was enlarged to 4272 by 2848 pixels (12MP). Compare the two images. If the high-resolution image shows details that are not present in the low-resolution image, then this indicates a loss of information when taking a low-res photograph. Otherwise one can safely use the low-res setting of the camera. In this latter case the limiting factor for image quality is not the resolution of the camera, but rather the optics or the specimen. The result? There was barely any discernible difference between the images. With the specimens that I used, it is perfectly OK to use the smallest camera resolution of 3MP. The limiting factor, so to say, is the optical system of the microscope and/or the specimen itself. For this reason, it is not necessary to choose a high resolution camera setting. Other specimens may deliver finer images, so the differences may become evident then, but from what I found, a small image resolution of 3MP is sufficient. Very nice site you have. Just a suggestion. Instead of enlarging small image try reducing large one to the resolution of the small. This way you’ll reduce noise in the image, while preserving resolution. We (amateur astrophotographers) use this a lot. 50D than in the 300D, hence the differences in image quality. I love your site. Very nice and very interesting. Which resolution is the best, may also depend on what you will do with the photograph. If the resolution is higher you can make larger prints or you can crop the detail that is of interest. You did not enlarged the high-resolution image and compare this with the enlarged low-resolution? I think the differece is also depends on magnification ratio. Lower magnifications can produce more detailed images. 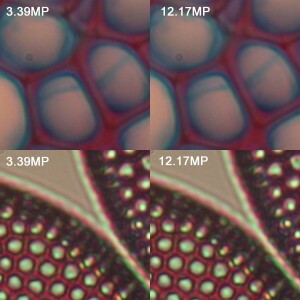 It would be interesting to compare megapixels with lower magnification. Higher magnifications provide less detail because of optical limits of microscope. This is why the maximum magnification of a light microscope is around 1000x.